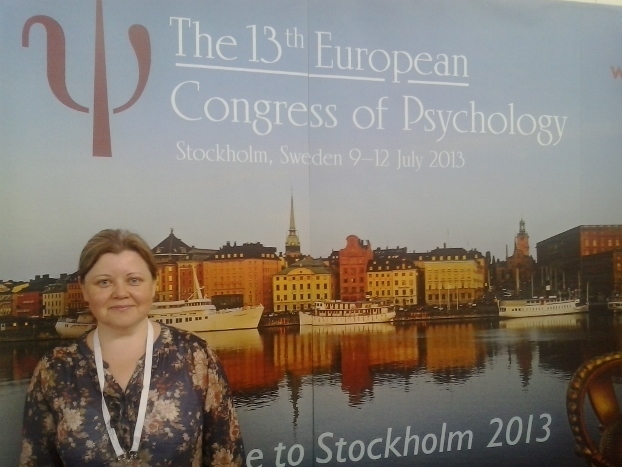 The 13th European Congress of Psychology (ECP 2013) was held in Stockholm, Sweden on 9–12 July 2013 under the auspices of the European Federation of Psychologists’ Associations (EFPA). Professor Anita Pipere was the sole representative of the Daugavpils University at this congress that was attended by about 10 participants from Latvia. As usually, European congresses provide a venue for the thematic sessions, invited symposia, keynote lectures, state of art lectures and poster presentations on the most contemporary topics of psychology. Among others, the special importance this year was placed on the issue of workplace stress and health promotion, so urgent for exploration and teaching in present-day Latvia. At this congress Anita Pipere and her co-author Aivis Dombrovskis presented the poster „Future dreams and hopes of prospective professionals: The effect of gender and speciality”. The studied issue got the feedback from several researchers both from Europe and worldwide (Spain, Canada, Taiwan, etc.). The participation permitted to learn about and explore the most recent developmental trends in European psychology. The most impressive events were keynote address by Jüri Allik Personality psychology between human universals and characteristic adaptations and presidential lecture by Robert Roe Does psychology care about people? These presentations were interesting, creative, thought-provoking and challenging for the researchers as well as practitioners. Especially appropriate for the research context of ISE was the lecture of R.Roe that implicitly pointed to the need of mixed method design, qualitative methods and legitimate support for researchers from developing countries striving to publish their research in serious Western journals. The attendance of this Congress by A.Pipere was made possible thanks to the financial support from Else Marie Tschermak’s Foundation.